01/27/2017, Camden, DE - SeoSamba announced the imminent release of SeoToaster Customer Relationship Management (CRM), which plugs onto the free and open source SeoToaster Ecommerce and CMS software, and integrates with SambaSaaS marketing automation cloud software. SeoSamba's CEO Michel Leconte will premier SeoToaster CRM at the 2017 annual International Franchise Association Convention (IFA 2017) on Sunday, January 29, 2017, and offer sneak peeks to a selected few of the over 4,000 attendees expected through Wednesday, February 1, 2017 at the Mandalay Bay Convention Center in Las Vegas, Nevada. With this latest addition, SeoSamba's marketing automation framework, which includes SambaSaaS, SeoToaster CMS, Ecommerce and now CRM, offers the most comprehensive feature set from a single vendor in today’s marketplace. “SeoToaster CRM is a major milestone in SeoSamba’s constant quest to deliver cost-effective online marketing solutions to a wide range of customers, from small and medium businesses through growing franchises brands, all the way to leading media companies under private-label arrangements” Mr. Leconte said. SeoToaster CRM is completing the SeoToaster line of products which can be used independently, or for best results as a fully integrated suite, including SeoToaster CMS, SeoToaster Ecommerce, and SeoSamba’s SambaSaaS online marketing platform. With the free SeoToaster CMS, small businesses can build their website, and take advantage of the integrated Google News compliant blog, or easily creating private areas for members among other professional grade features, with just one install. Users upgrading to SeoToaster Ecommerce - also free to use - can add a web store simply and rapidly, and leverage a vast number of integrated merchandising features such as group pricing, couponing, multi-level-marketing, email remarketing, recurring orders, and virtual products. Once SeoToaster CRM is released next month, any business including both business services and retail franchises will be able to supplement their websites or web stores with robust sales components, as well as advanced marketing automation features which are particularly suitable to distributed organizations. SeoToaster CRM tracks and records all inbound and outbound activity, including phone calls, and integrates with most calendars including Google and Outlook for meeting scheduling. 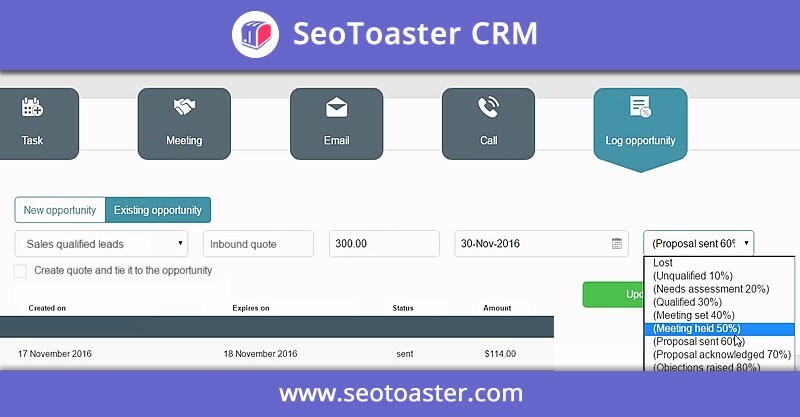 SeoToaster CRM also integrates with Constant Contact for cost-effective mass emailing, and ships with a powerful email drip sequence system that keeps in touch with both prospects and clients in automated fashion. Sales managers can collect information about all website visitors and find out exactly when their existing contacts browse their website, what pages they visit, which forms they submitted, or which white paper they've downloaded, as well as who is opening emails and looking at attachments. Sales quotes can be generated automatically from website by online visitors or assembled by sales representatives from the back-office. In any case, reps can be notified and connect in real time with prospects who are currently looking at their proposals. All purchases, whether made from sales quotes, or directly from the integrated shopping cart, are logged under their corresponding contact profile. When deployed together and enhanced by a subscription to the SambaSaaS marketing cloud, SeoToaster software provides a uniquely effective toolset for small businesses, franchising brands, and web store owners. SeoSamba's pixel-perfect and site reboot packages provide everything from an initial benchmark all the way to a comprehensive website delivery along with performance improvement guarantees for both services websites and web stores. SeoSamba's CRM onboard package provides a turnkey setup of our CRM application with migration/import from your existing solution, be it InfusionSoft, Salesforce, or others. From managed SEO programs through social community management, SeoSamba professional services staff consistently delivers marketing value-add, and plugs directly into the software front and back ends. A single highly competent interlocutor to handle everything from mundane support to custom functionalities development. SeoSamba's integrated services approach means that customers can get support for their website, web store, CRM, marketing & sales automation software through a single point of contact, directly from the software manufacturer. With an emphasis on execution, the results-driven software maker is now delivering associated services to its fast growing base of users. “We perfected the formula to deliver services very effectively,” Mr. Leconte said, “by leveraging the unparalleled expertise of our professional services group to support our powerful integrated software suite. Customers therefore enjoy a direct relationship with the software maker who has intimate knowledge of the software’ inner-working, ensuring the best possible pricing and outcome." SeoToaster is the most advanced SEO & marketing CMS and eCommerce platform that can be used right out of the box, with no plugins required. SeoToaster features a uniquely intuitive content management system interface, combined with powerful automated marketing. Open source and customizable at will, SeoToaster is available for use and download free of charge at http://www.seotoaster.com.